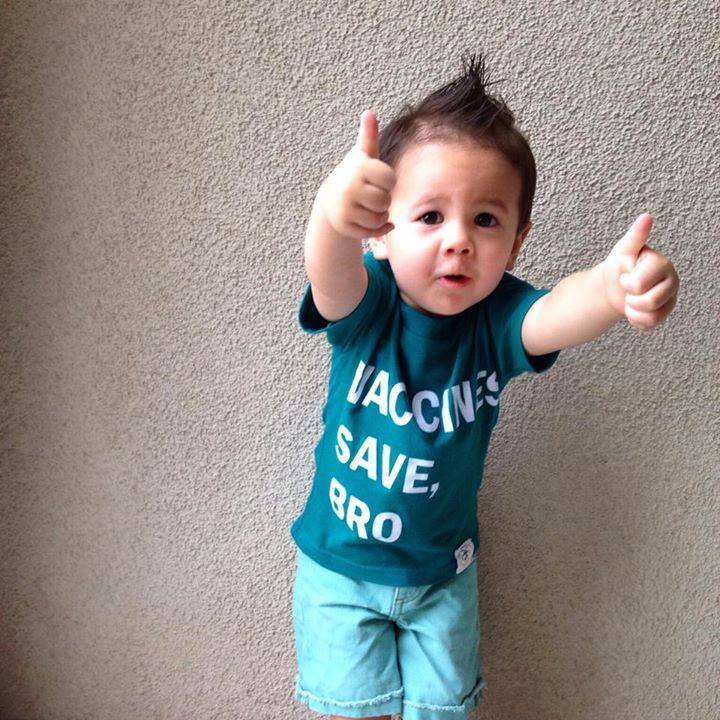 Throughout August and September, clothing designer Wire and Honey donated a percentage of proceeds from “Vaccines Save, Bro” T-Shirt sales to the National Meningitis Association! During this time, NMA held a photo contest – anyone who shared a photo of themselves or a loved one in a T-shirt by posting it to NMA’s Facebook page was entered. We announced the winner, Chrystal Light, a pediatric nurse who entered a photo of her adorable son Dylan, age two, at the end of September. We chatted with Chrystal about what inspires her to support vaccination. Q. What inspired you to enter the contest? How did you find out about it? A. I found out about the contest through Wire and Honey’s Instagram account. The message is definitely something I stand behind, so I took a really cute pic of my son and it worked out! Q. What experiences have you had as a pediatric nurse that have encouraged you to support vaccination? A. I have taken care of patients who are immunocompromised and aren’t always able to receive vaccines on schedule. I believe in the importance of what we call “herd immunity,” where everyone gets vaccinated to help protect others who can’t be. This protects them from the diseases that they can’t get vaccines for – from chicken pox to measles mumps and rubella. Q. What would you say to people who are hesitant about vaccinating their kids? A. Usually in a nice way, especially on social media, I try to point them to the latest research. We see families in the hospital who don’t vaccinate their children, and we usually refer them to a doctor, who will explain why it is so important that they stick to the vaccine schedule. Q. How would you suggest parents stay on top of their kids’ vaccination schedules? Make sure they see their pediatricians when they’re supposed to, which is usually timed to coincide with their vaccinations. Make sure they stay on top of CDC’s schedules of recommended vaccinations. Keep up-to-date immunization cards for their children. Congratulations, Chrystal! Thank you for helping us to raise awareness about life-saving vaccines!